We like our sweets. Organic, fair trade, Non GMO sweets. You'll often hear someone wandering around the office asking if anyone has any chocolate. And usually, someone does. Last week, we decided to have lunch and make cookies at Kevin and Annmarie's house. What a way to spend the day! Here are some photos of our day and the recipes we used to make our treats. 🙂 Sorry about the quality of some of the photos, we took them with our phones! 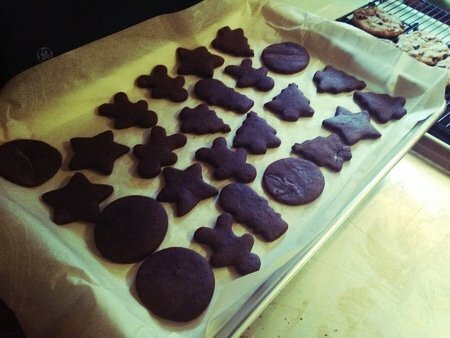 Annmarie made gingerbread cookie dough for the first time… This special kind of dough is very sticky and tricky to work with! 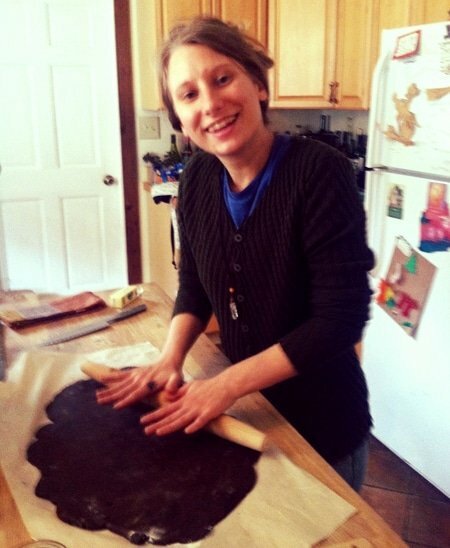 Aubrey (pictured) took on the muscle-tiring task of rolling the dough out. She makes it look so easy! We took to the dough with cookie cutters and an explosion of stars, snowmen, and Christmas trees followed. And circles, which are maybe festive somehow? Hudson watches Annmarie roll up raisins and put them on the snowmen as buttons. He had a blast helping us frost the cookies! 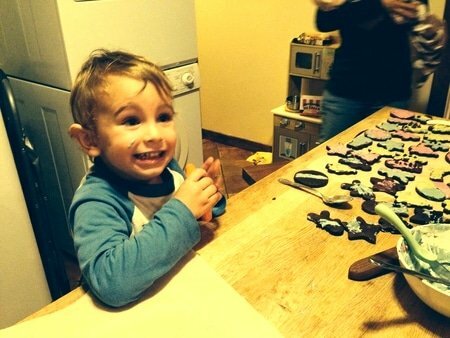 Like we mentioned, Hudson had a great time decorating the cookies! 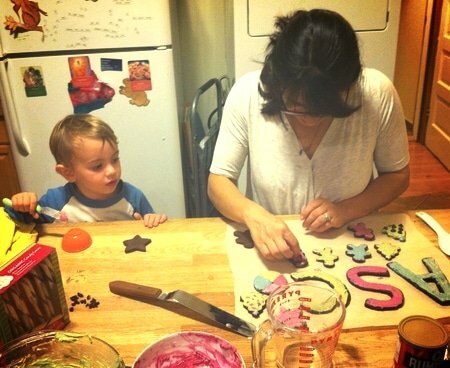 He doesn't eat tons of sweets, but he sure enjoys the artistic side of baking. If you thought we stopped at gingerbread, think again. 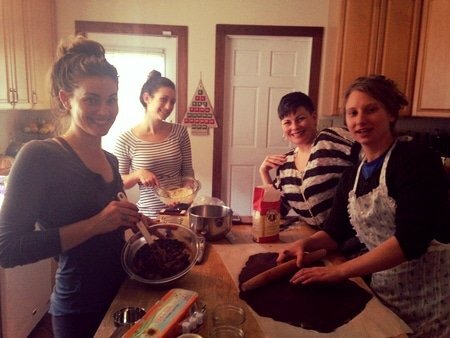 Here, Rachel (left) mixes up her famous brown butter chocolate chip cookies and Hope (middle left) whips up some snickerdoodles. Natalie (middle right) provided moral support through serenades and jokes. 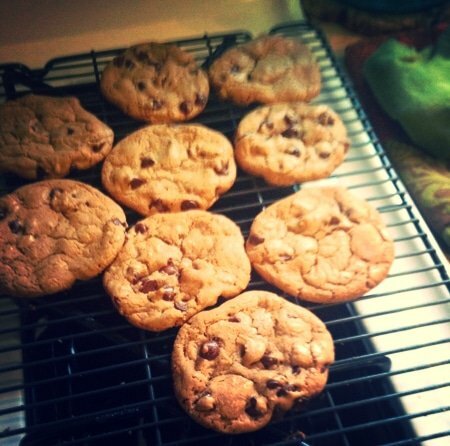 Here are the finished Chocolate Chip Cookies. So. Much. Yum. We also made gluten-free cookies! 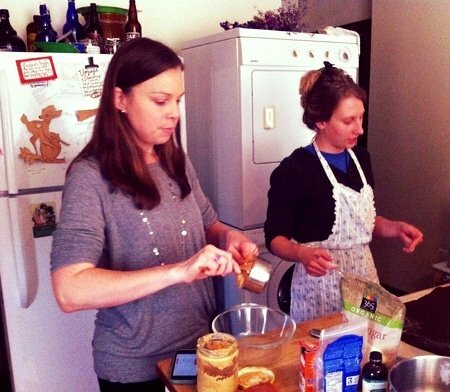 In this photo, Lisa scoops some peanut butter to make flourless chocolate chip peanut butter cookies. Brown the butter in a pan on the stove, then mix with sugars. Allow this mixture to cool down before doing anything else. Add eggs, beating in one at a time, and vanilla. Fold in the ​dry ingredients, and then add in chocolate chips. Scoop onto a baking sheet and bake for about 10 min on 350°F. Preheat oven to 350°F. Stir together first 5 ingredients until well blended . Drop dough in rounded tablespoons onto a parchment paper-lined baking sheet, 2 inches apart. Bake at 350°F for 12-14 minutes or until puffed and lightly browned. Cool on baking sheets on a wire rack for 5 minutes before transferring to a wire rack to cool. Preheat the oven to 400°F Cream butter, shortening, sugar, vanilla, and eggs together thoroughly. Mix in the rest of the ingredients until incorporated, and shape your dough into round balls about 1 inch in diameter. Place the dough balls about 2 inches apart on a lined cookie sheet and bake at 400°F for 8-10 min. Mix first three ingredients with 1/2 cup cold water, then add salt. Add spices and 3 cups of flour. Mix 2 tsp baking soda with 3 tbsp cold water, then add to dough mixture. Add remaining 3 cups of flour and mix. After chilling, roll out on a well-floured surface until it's about 1/4 inch thick. Use cookie cutters to cut out shapes and bake at 350°F about 10-15 minutes. If you make any of these recipes, let us know in the comments below!